Estimation of Direction of Arrival (DOA) is a vital task in many practical applications such as smart antennas, high-resolution radar, underwater acoustics, noise reduction, to mention a few. DOA estimation survives as a front end to beamforming algorithms. Beamforming uses an array of antennas/sensors to transmit/receive signals to/from a specified spatial direction in the presence of interference and noise. Interference signals are considered as signals that are correlated with the desired signals. Noise signals (a.k.a. distractors) are considered as not correlated with the desired signals, and can be either considered directional or ambient sources. 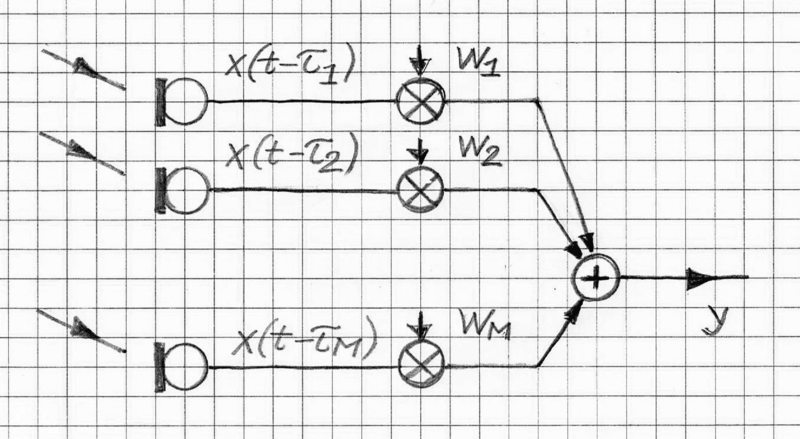 where w is a weight vector (as illustrated in Figure 1); T and H denote vector/matrix transpose and conjugate transpose, respectively. Adaptive beamforming is used for enhancing a desired signal while suppressing noise and interference at the output of an array of sensors. Figure 2 depicts the structure of an adaptive beamformer. In applications where signal always present but its strength is unknown, application of linear constraints to the weight vector permits extensive control of the adaptive behavior of the beamformer. 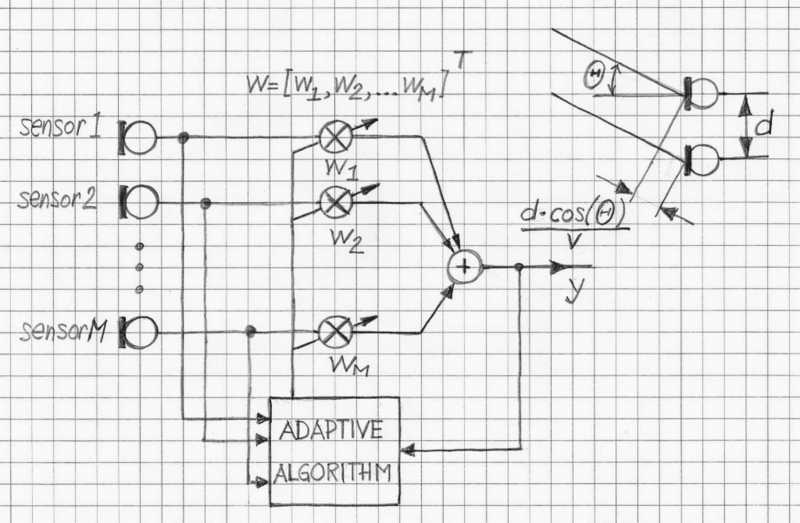 One of the more effective approaches to adaptive control of the beamformer is the Multiple Signal Classification (MUSIC) algorithm that uses the eigenvectors decomposition and eigenvalues of the covariance matrix of the antenna array for estimating directions-of-arrival of sources based on the properties of the signal and noise subspaces. A viable alternative to the MUSIC algorithm is an approach called ESPIRIT (Estimation of Signal Parameters via Rotational Invariance Technique). ESPIRIT is based on the rotational invariance property of the signal space to make a direct estimation of the DOA and obtain the angles of arrival without the calculation of a pseudo-spectrum on the extent of space. ESPIRIT is similar to MUSIC algorithm yet with various modifications. The simplicity of its implementation (although at the cost of spatial resolution degradation) is considered as an approach of choice in some applications. 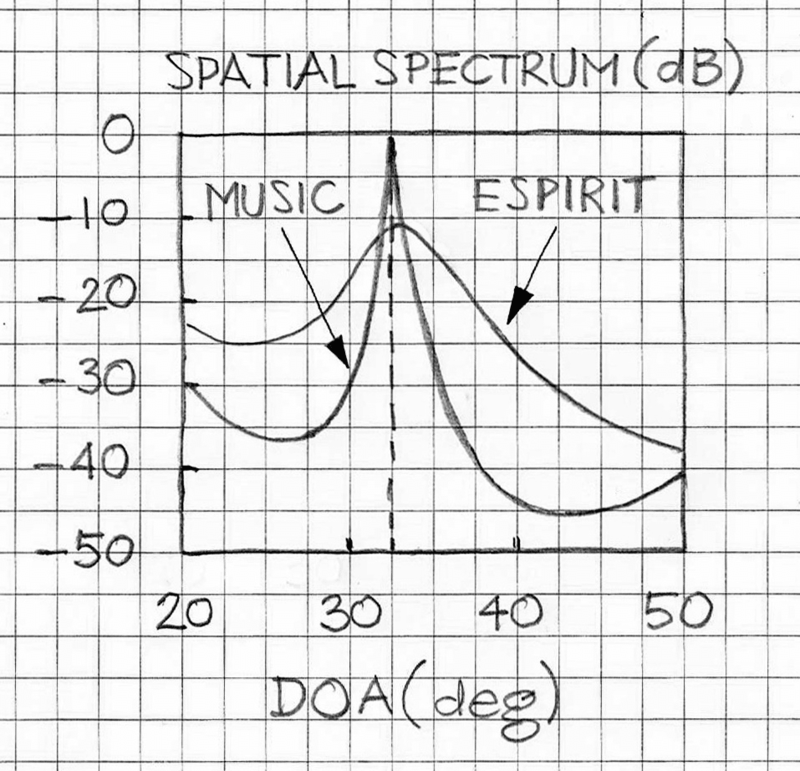 Also, ESPRIT is less sensitive to uncorrelated noise than MUSIC (cf. Ref.1). Figure 3 illustrates an example comparison between these two approaches (cf. Ref 2). While MUSIC shows better spatial resolution than ESPIRIT, it is important to note the comparison is a function of data; thus graphs will look differently for each case under consideration. Vocal Technologies Ltd developed adaptive beamforming for noise reduction. One of the features is based on implementation of the MUSIC algorithm which is available as part of the beamforming software library. Contact us to discuss your beamforming application requirements.